The holiday has meant many things. Lots of overdue catching up with family and friends (when I wasn’t sick as a parrot!) all of course, accompanied by lots of totally unnecessary, but highly enjoyable, overeating and over indulging. And lots of excessively late nights. Which of course, are followed by late mornings. Next week puts an end to all that, as I start on a new science-led nutrition and workout programme (let me know if you want to hear more about that). Everyday routine beckons, early morning starts become de rigeur again and the alarm will be rudely awakening me at 6.30pm. All very normal, of course, but the idea of savouring a few extra minutes in bed becomes an all encompassing obsession as I search for ways in which to streamline and simplify the morning makeup routine. And so I present to you the simplest eye of all. Defined, yet minimal. Groomed, yet not looking made up. It’s so easy it hardly merits a post all of its own. But here it is, in all its minimalist glory. So after moisturising with my favourite Zelens Triple Action Advance Eye Cream, and doing a quick base with whichever foundation is currently on rotation, I’ll make sure to spend a good minute or two on my concealer. 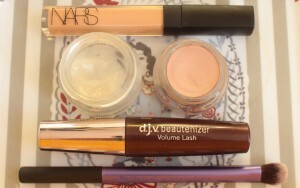 I still haven’t found anything that’s getting me as bright eyed and bushy tailed as beautifully as NARS Creamy Radiant Concealer in Biscuit, which I apply using the sponge applicator, blended with fingers or, if I have time, my Real Techniques Base Shadow Brush, the latter giving a more airbrushed finish. To create a flawless, bright eye, I’ll use MAC Paint Pot in Painterly on the whole moving eyelid extending just up and over the crease line . No time to paint a precise eyeliner, so lashings of mascara are all I’ll use to define the eye – whichever mascara I have to hand will do, current fave is still my d.j.v beautenizer Volume Lash which I’ve already raved about so many times I’ve lost count. And I’m out the door! Check back later this week for an update to this post – I’ll be posting a very neutral, yet slightly more made-up eye – think Nigella Lawson, whose eye makeup I’m always drooling over.